Aaron Ramsey has issued Arsenal a vital fitness boost ahead of their 2018-19 Premier League opener against Manchester City after the Evening Standard disclosed that 27-year-old returned to first-team training on Thursday and also that he’s reportedly aiming to be in contention for a starting place in Unai Emery’s fold come Sunday’s clash. Ramsey, before the Gunners’ pre-season tie against Chelsea earlier this month, was omitted from the matchday fold having sustained a calf injury in the warm-up, a setback which meant that the chances of Wales international being ready for the start of the domestic campaign were exceedingly slim. The rehabilitating craftsman allegedly spent the beginning of the week training independently, but after finally returning to the north-Londoners’ contingent at the club’s London Colney training facility, there’s certainly cause to speculate that he’ll be raring to ask substantial questions of the Citizens at the Emirates. 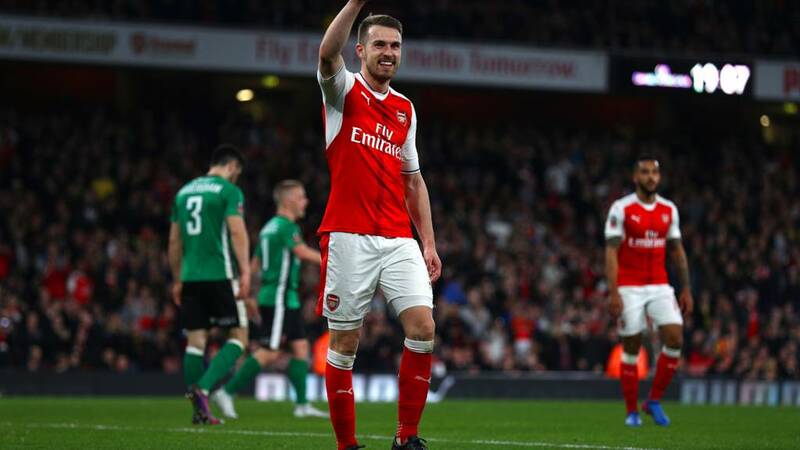 Arsenal’s regenerated midfield will rely greatly on Ramsey’s imperious creativity to unlock Pep Guardiola’s formidable defensive quarters and his potential inclusion will please the likes of Alexandre Lacazette and Pierre-Emerick Aubameyang amongst others, as well as the fans, of course. The intricate playmaker will be able to dart, disrupt and orchestrate more freely now that Lucas Torreira is on the club’s books. The dogged Uruguayan will naturally shepherd behind Ramsey and plug the gaps that the former Cardiff City protagonist leaves behind him as he endeavours to sculpt devastating phases where the Sky Blues could be compromised. Share the post "Aaron Ramsey returns to first-team training ahead of Manchester City clash"